Two Custom Pool/Spa Packages with a San Juan Fiberglass Pool as ideas how you can perfectly round off your new Dream Home built by Anthony Fiore Construction. The two Packages are designed to fit our Model Homes in Bungalow Style. The Pooldeck is approximately 720 SqFt and is covered with Flowcrete Finish. The same Flowcrete Finish for the Lanai of the House is included. As South West Florida Distributor, Anthony Fiore Construction installs the far better Fiberglass Pools by San Juan. The Pool is approximately 26 feet by 12 feet whereas the Customer can choose among many Shapes and Sizes offered by San Juan (within the same basic sizes). We only install the best materials like Poolbricks, High-Efficiency Pool-Equipment, Flowcrete Finish on Decks, etc. A custom built Cage with Screen and one Screen-door is included and will be erected around your Pooldeck and attached to the roof with a Supergutter. The colors of the Pooldeck and of the Poolbricks can be chosen by the Customer. 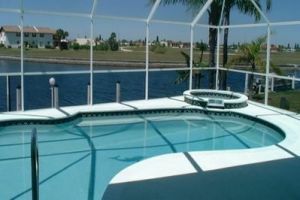 If you add a Spa to your Pool, then we enlarge the Deck and Cage to accomodate the Spa. Anthony Fiore Construction is a Licensed Plumber and Pool-Builder. please visit our Swimming Pool Division.